My Archetypal Vessels reflect my ongoing fascination with the history of civilization, revealed through ancient objects made of clay. 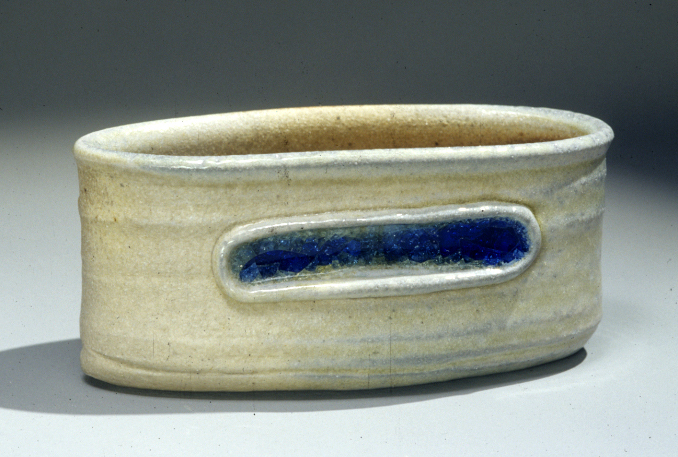 Ceramic objects are storytellers of past lives and communities. While paintings fade away, metals corrode and wood and textiles rot, ceramics survives millennia and offers glimpses of cultures that have ceased to exist. I enjoy re-interpreting these powerful forms and sacred designs with added notes of the current era. The Pithos Portal vessels are based on ancient Greek storage containers from 1400 BC. Some were taller than a person, and they were used to contain grains, oil, wine and water. Sometimes they contained human remains. In my version I have used family photographs that I made into decals and fired on the circular elements. The images are from my Greek Grandmother’s 1955 photo album; she had returned to Greece to visit her family after living in America since 1920. She is the one in the smart, light colored suit. Her mother(my great grandmother) is holding her spinning and one of the rugs she wove is draped around the vessel.